Are you refurbishing your home but can’t afford the lavish décor? Fret not! There are numerous DIY ideas and tutorials available online to help you out. You can create amazing things out of low cost materials readily available at your home. These affordable ideas can make your home look luxurious and magnificent. 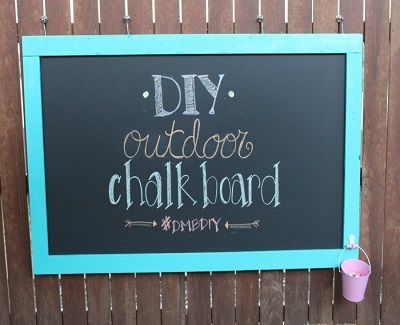 Here are 7 incredible and inspiring ideas to ramp up your outdoors! 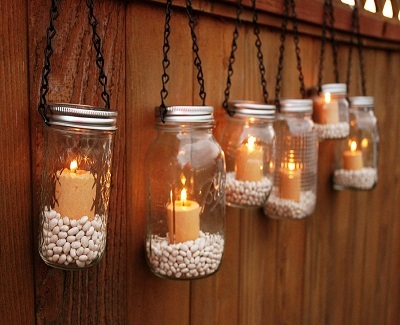 Light up your outdoor space with simple hanging jar lanterns. All you need to do is take some empty mason jars and fill them up with candles or fairy lights, and decorative filler such as beans. Take a steel wire or chain and convert it into a choker wrapped around the top of the jar with a loop on top. You can hang it with tree branches, your fence, or hooks. These glowing lanterns would enhance the romantic and charming ambience of your outdoors. 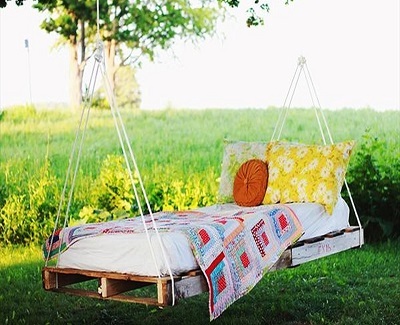 What can be the better way to spend a lazy afternoon than by reading a book or enjoying your coffee in a hanging bed? Take a wood pallet and secure the rope to each corner of the pallet to hover it from a strong tree or in your patio. You can add a mattress and pillows on top to make it comfier. You can modify the wooden pallets at your home to create beautiful planting space for your outdoors. Affix small pots or mason jars on a pallet board with the plumbing clamps and plant colorful flowers or herbs in these pots. 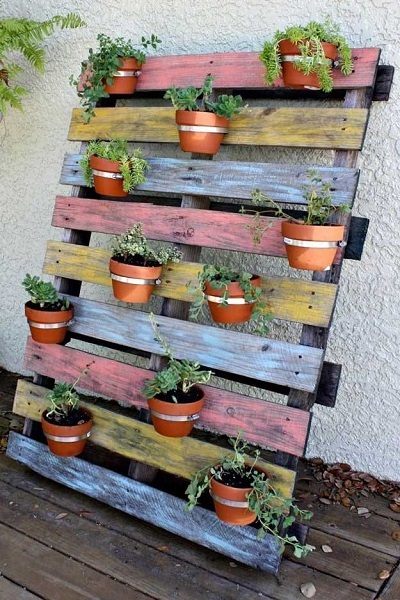 You can place this vertical planter in your garden or patio, or hang it on the fence wall. Painting it in sharp colors would further enhance its appearance. Stones are readily available in everybody’s garden. You can show your artistic skills by painting them in pretty hues and drawing interesting patterns on them. You can use them as garden markers by labelling them with names of fruits, vegetables or herbs that you have planted so that you don’t mix them up. 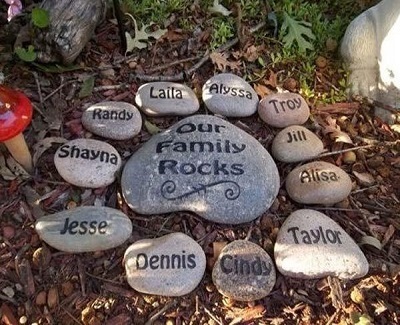 You can also personalize a corner of your garden by making arrangement of stones on the floor with your names on them as shown below. Adding a pathway in your garden is not only functional but gives it a dreamy appearance. You can use big stepping stones matching your garden’s theme to create the path. Or if you are craftier, you can opt for elegant mosaic stone path. 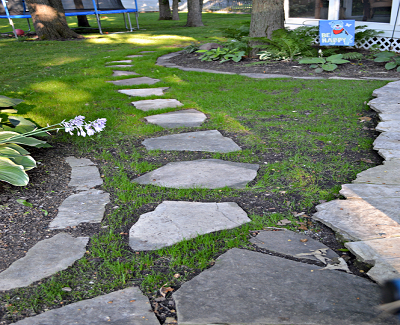 Here is a simple path made of left-over stones surrounded by the grass. This is one of the easiest and fun ideas, which you must try. This simple project can mostly be done with free items already available in your home. You can use it to write down daily reminders, or to display the menu items. 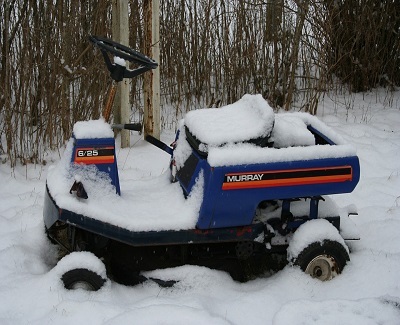 And obviously your kids will enjoy the most with this addition in your backyard. If you love to throw outdoor parties or enjoy BBQ from time to time, you must have a comfy sitting area where all your friends and family can gather. You need to put together wooden pallet sections to build an elongated L-shaped bench and a table. Top the bench with soft cushions. 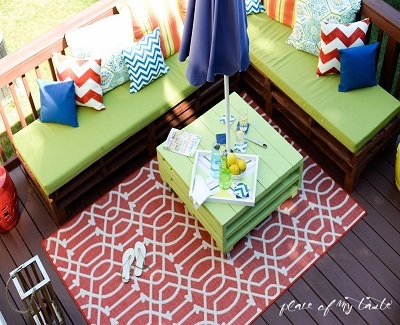 Add a colorful outdoor rug beneath the table to bring the whole look together. In order to ensure that these DIY projects remain in top-notch condition, you’ll need to maintain them properly.